With Memorial Day weekend behind us, summer has unofficially begun. 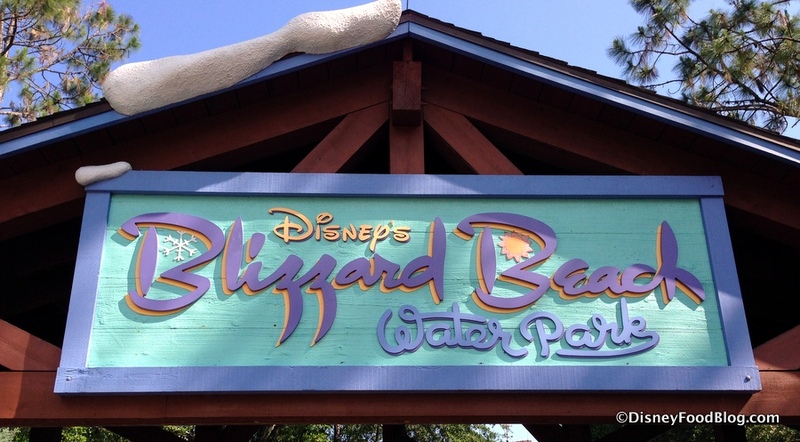 So grab your towel, OODLES of sunscreen, and (Swim) SUIT UP… because I can’t think of a better place to kick off the season than BLIZZARD BEACH!!! 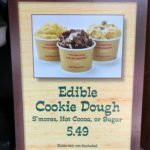 I don’t know about you, but fewer things make me as hungry as a day of splashing the day away at one of Disney World’s two water parks (Blizzard Beach’s counterpart is Typhoon Lagoon). So we thought it would be fun to take you on a little tour of the Quick Service spots around Blizzard Beach and grab a bite or two while we’re at it. We’ll start our tour at one of the first buildings you see as you enter the park. 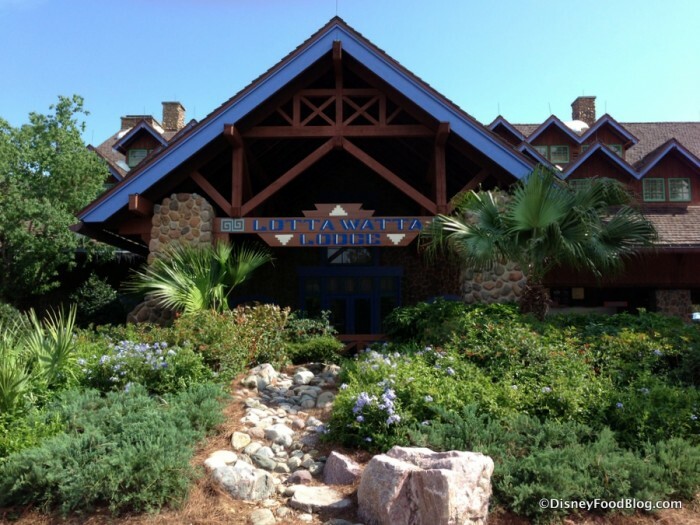 Lottawatta Lodge helps to immerse you in the setting and story of Blizzard Beach… . Once upon a time, a freak snowstorm hit Florida, resulting in the construction of a ski resort for folks to enjoy the wintery weather. With the return of typical Florida weather, of course, all the snow melted away leaving lots and lots and LOTS of water. 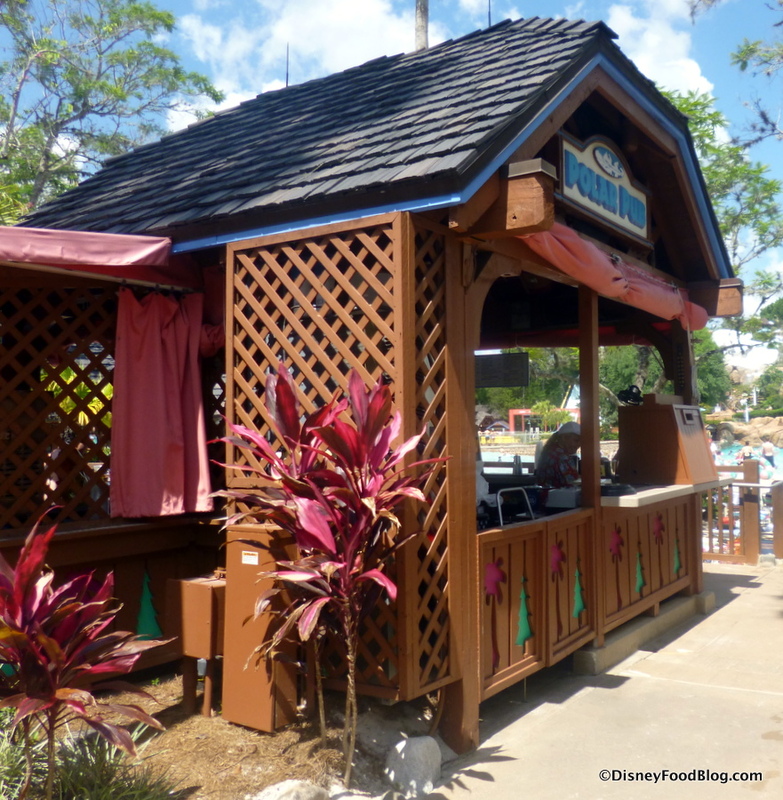 And the result is Blizzard Beach! Hence, Lottawatta Lodge… an Alpine-style ski lodge surrounded by palm trees 🙂 . 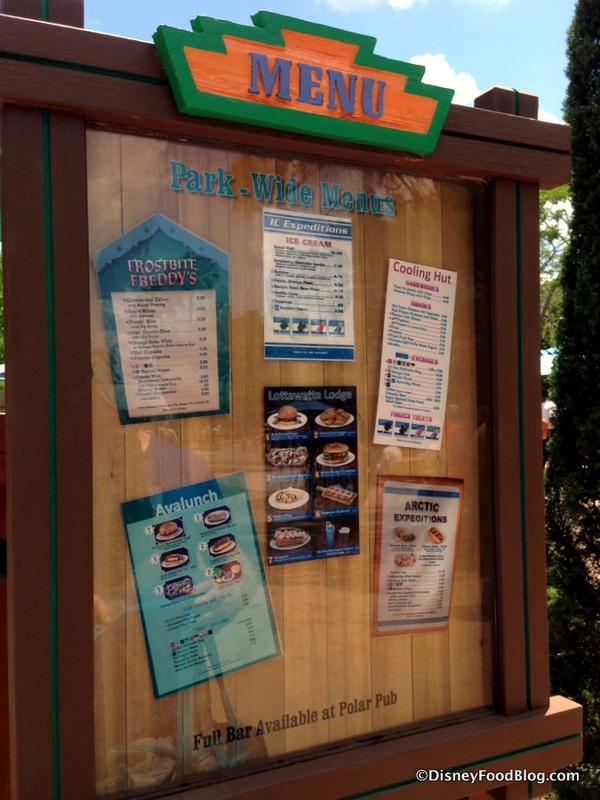 Due to its high-profile location, it would be fairly easy to mistake this as the only eatery in the park. That’s probably why there’s a full menu board notifying guests of additional food joints, and a map nearby to locate them (we’ll take a closer peek at the various menus as we go). Still, Lottawatta Lodge is the prime spot for Counter Service classics like Burgers, Chicken Breast Nuggets, and Flatbreads. You’ll also see some less expected items including a Shrimp Roll. 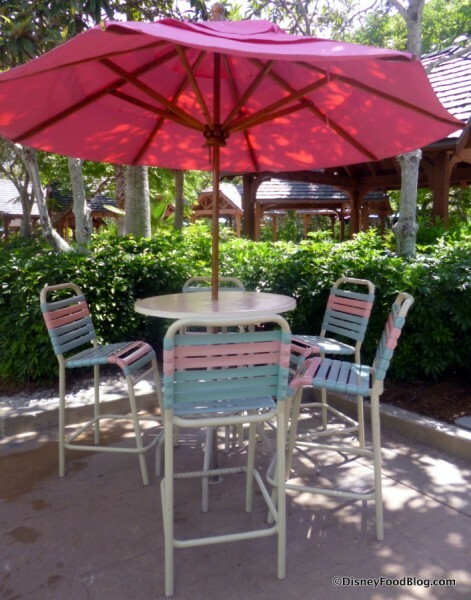 There is no indoor seating in the park. But picnic-style tables can be found at various locations, with the majority located at Lottawatta Lodge. 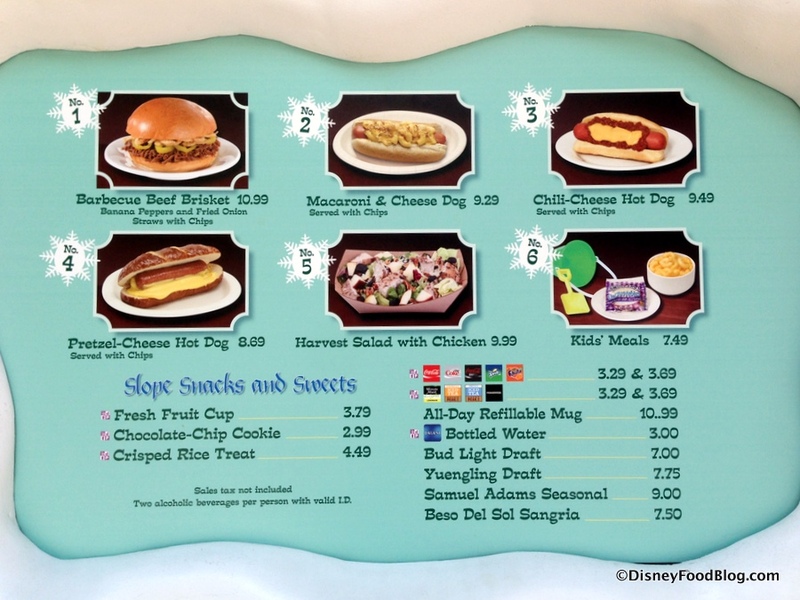 We’ll be stopping for a snack here later, but there are several other spots to check out! 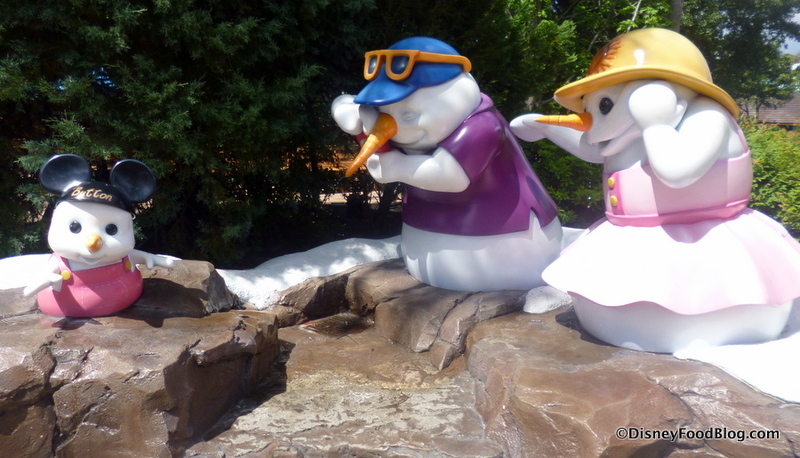 Another popular place is the Polar Pub, just within view of Melt-Away Bay (the park’s wave pool). 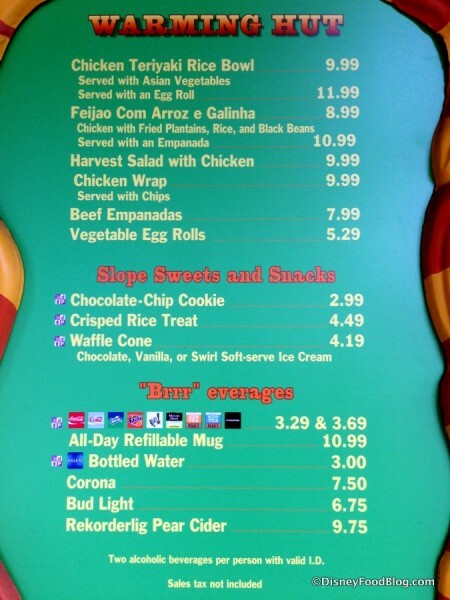 And once you look at the menu, you’ll understand why there’s often a small line 😉 . 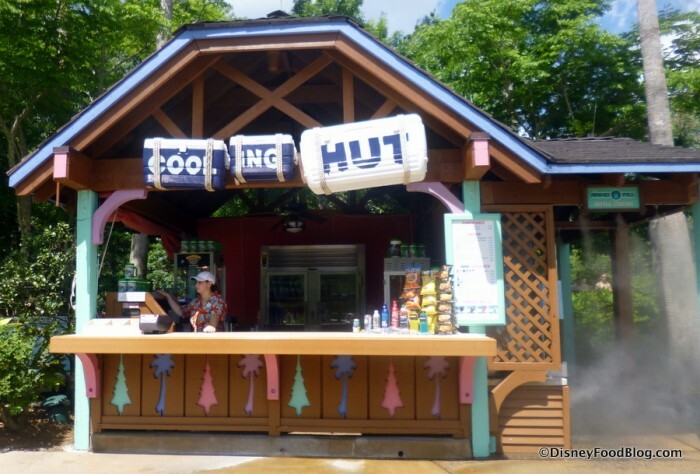 This Blizzard Beach bar features cocktails, wine, and beer. 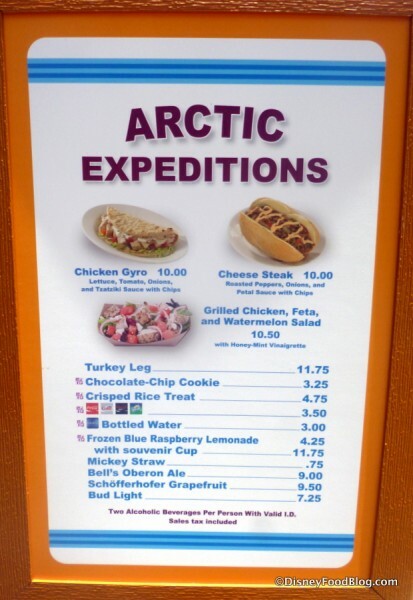 And there’s even an Epcot favorite on the menu. 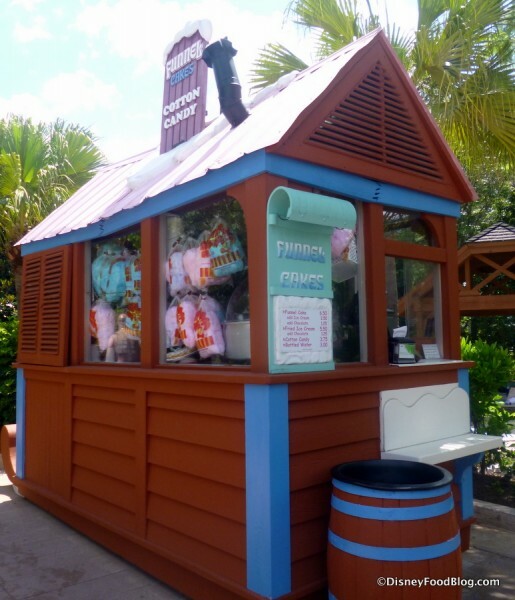 Did you notice that you can get the Grey Goose Le Citron Slush here?!? … and get ready to do some serious sippin’ in the midst of all the splashin’! The Cooling Hut offers a few basic sandwiches, but it’s primarily a snack, ice cream novelties, and soda spot. This is also one of the spots where you can purchase and refill your All-Day Refillable Mug. Now, these are NOT the same thing as your Refillable Resort Mugs. 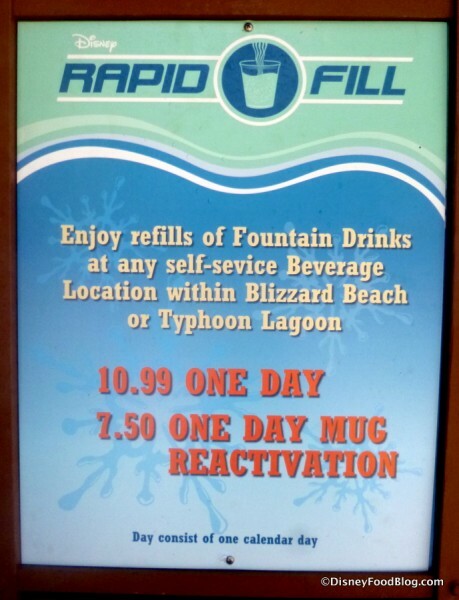 Those won’t work here, as the water parks have their own themed Rapid Fill Mug. This stand is named simply after the main thing it serves: Mini Donuts! But really… when THESE gems are your offerings, do you need to go by anything else? 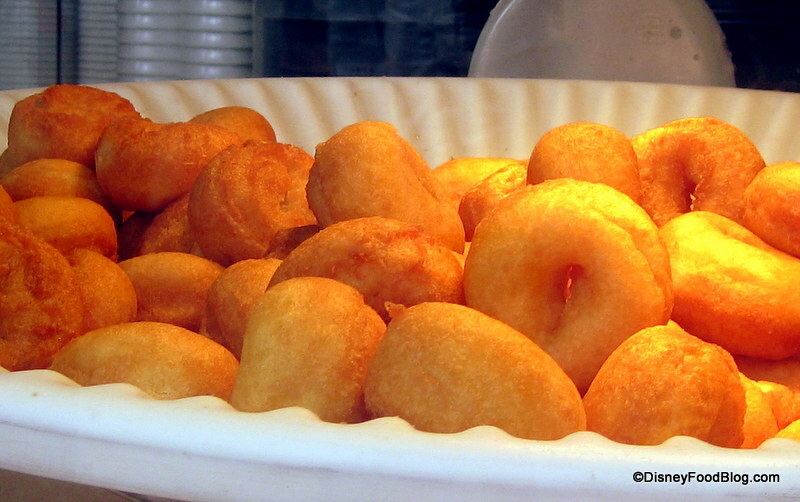 Just be warned: once you smell the frying Mini Donuts when you’re floating by on Cross Country Creek… you’re pretty much done for. They’re a must-try anyway, so just give into temptation and join in the fun! And don’t forget the Dipping Sauces, available in Chocolate, Raspberry, or White Chocolate. Funnel Cakes is another no-other-name needed kiosk, but remember that you can find those in the main parks. 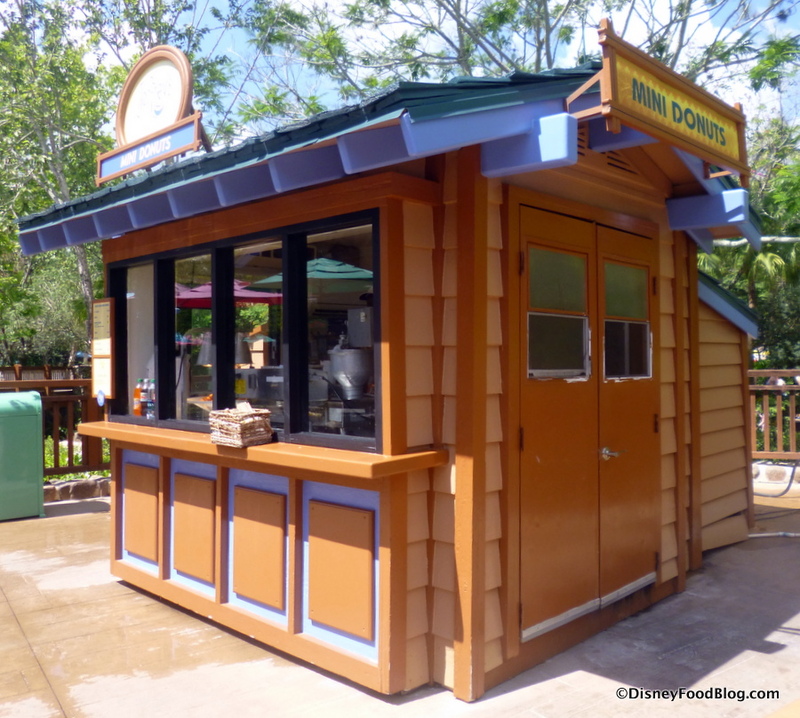 Mini Donuts, on the other hand, are a Blizzard Beach and Typhoon Lagoon signature! Either way, though, you’re walking away with a pile of fried dough, so I guess you can’t go wrong 😉 . There are no full meals at Frostbite Freddy’s; it’s just snacks here. But one of them is a doozy. 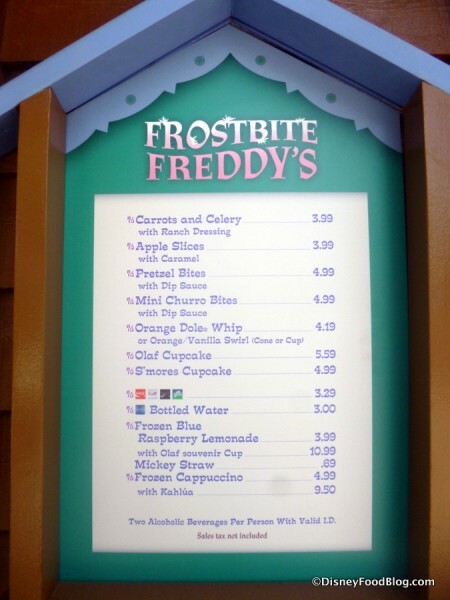 You can find ORANGE DOLE WHIP at Freddy’s!! When they used to serve both Pineapple and Orange Dole Whip back in the day at Aloha Isle, my favorite combo was a Pineapple and Orange Swirl Float. 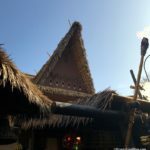 Sadly, there’s no chance to swirl here (with Pineapple, that is — you CAN swirl with Vanilla), but I was still excited to have some Orange Dole Whip once more. So you can imagine my sadness when I was informed that the machine was broken. So what else could I do but drown my sorrows in some ice cream? I.C. 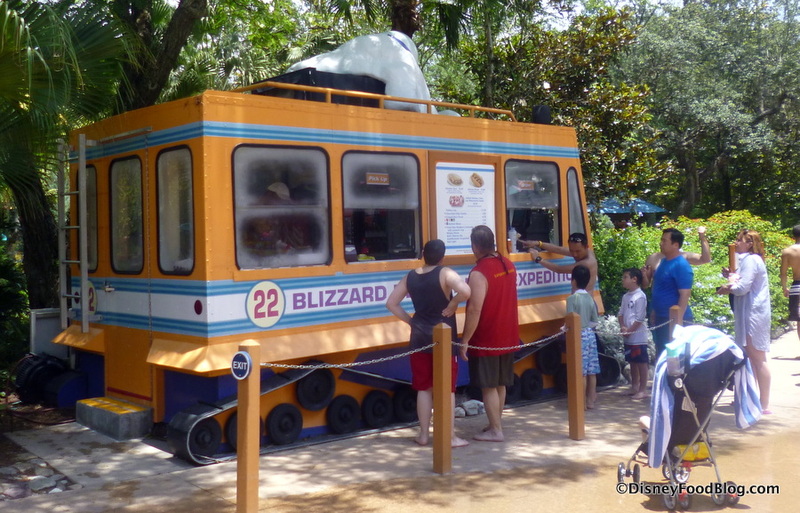 Expeditions is THE stop for ice cream specialties at Blizzard Beach. 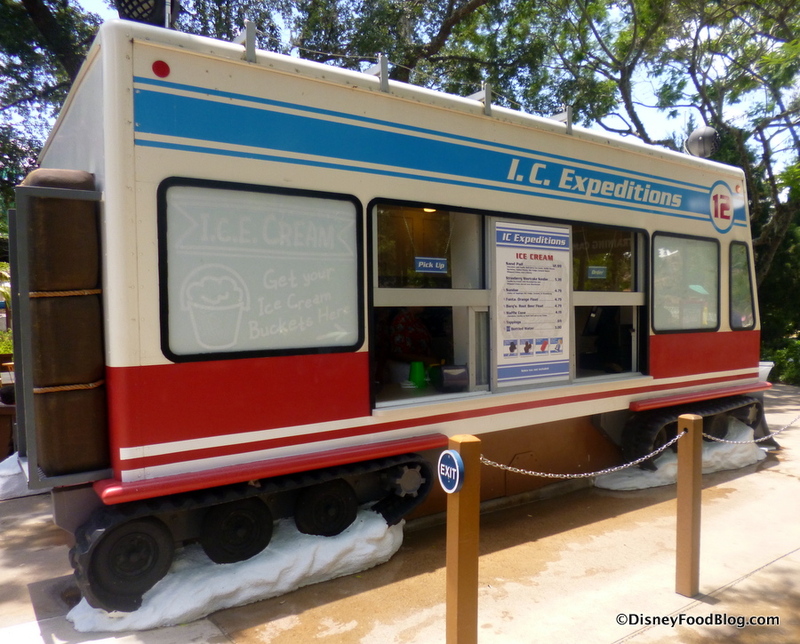 It’s most famous for the Sand Pail, which is the Blizzard Beach and Typhoon Lagoon equivalent of the Kitchen Sink on a somewhat smaller scale made with all the ice cream fix-ins’ in the house… I mean, truck. 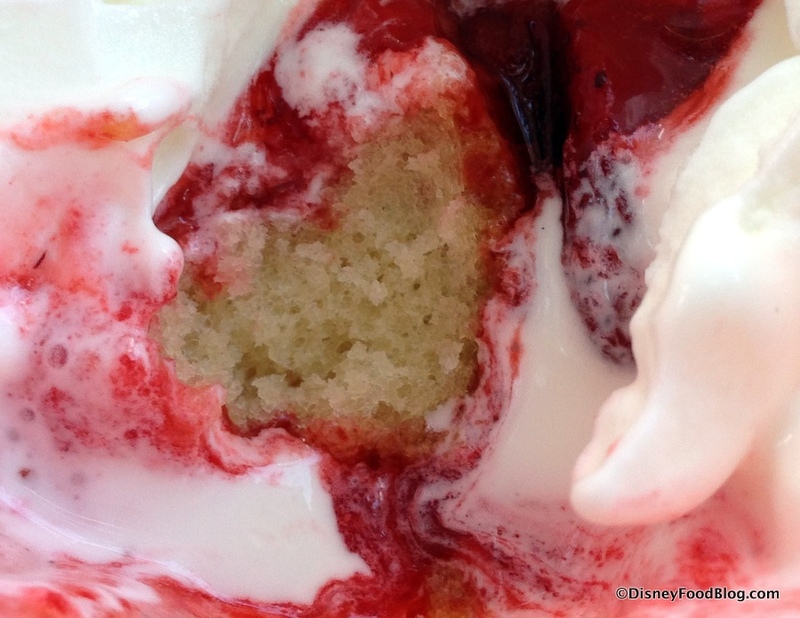 But we went for the Strawberry Shortcake Sundae. 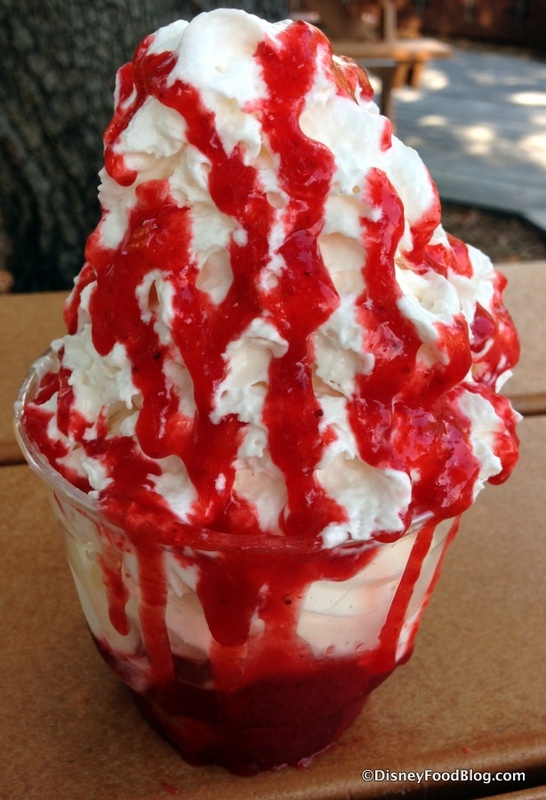 Now, it may look like a whole pile of whipped cream and strawberry sauce, and while there IS a lot on there (ooray! ), I promise there is plenty of vanilla soft serve under that mountain of whipped cream. It’s short (no pun intended) on the cake, though. 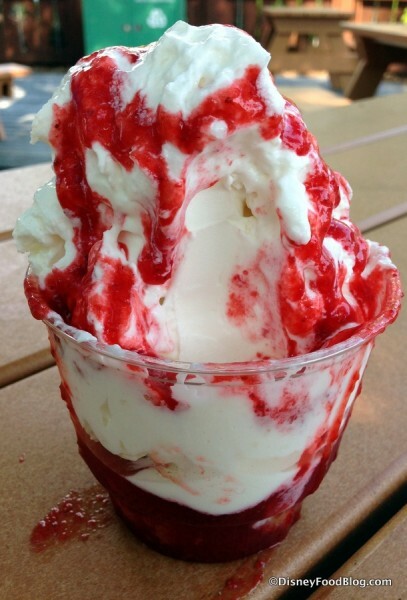 There’s just a bite or two of it in there, so the emphasis is definitely on the ice cream. The menu at Arctic Expeditions is small, but offers some big eats (including Turkey Legs!). My husband chose the Cheese Steak topped with roasted peppers, onions, and petal sauce, with provolone cheese on the bottom of the meat. It’s served with a bag of Lay’s Chips. This sandwich was pretty well packed, and — even though it wouldn’t stand up against a traditional Philly Cheese Steak — the flavors were decent. There was a major drawback, though. The peppers weren’t drained, turning what could have been a nice, hearty sandwich into a soggy mess, making it far less appetizing. Just across the way, Avalunch serves a variety of hot dogs along with a Beef Brisket Sandwich and a salad. 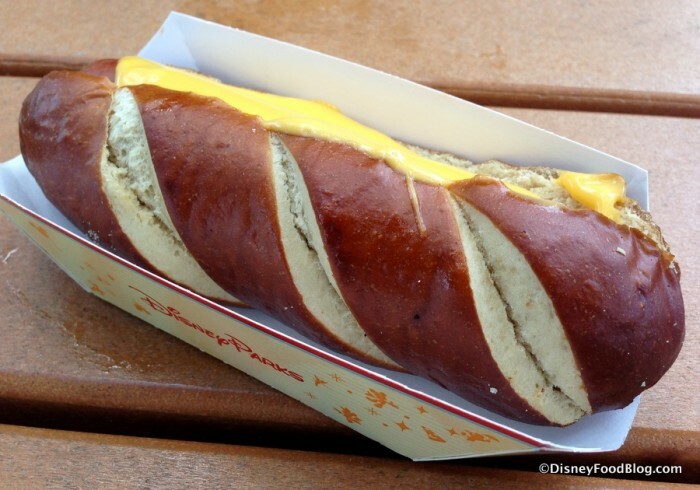 I was ALL ABOUT that Pretzel-Cheese Hot Dog. Every ingredient is in the name 😉 . Hot dog? Check. Pretzel? It’s the bun. Cheese? 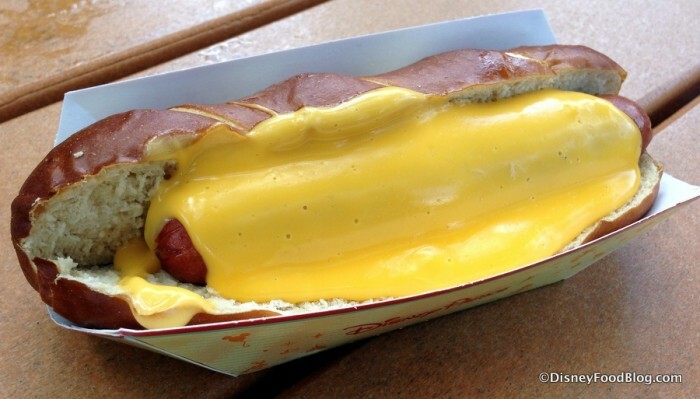 Oh, yeah… the whole thing is covered in a river of good ol’ plastic cheese!! 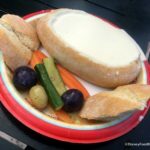 It’s honestly like getting a soft pretzel and a side of cheese sauce… with the ADDITION of a hot dog (a really tasty one, I might add). You’re looking at two snacks in one here! 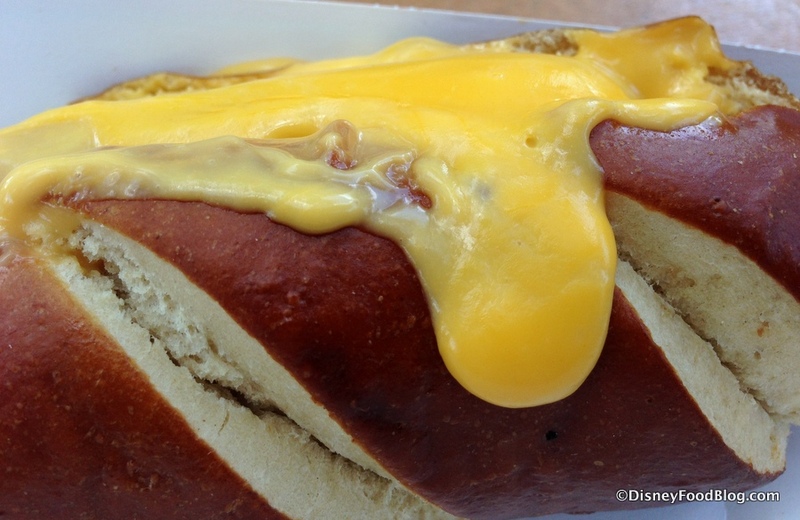 The pretzel bun was nice and soft, and even though the cheese ends up everywhere, the Pretzel-Cheese Dog is worth every messy bite. 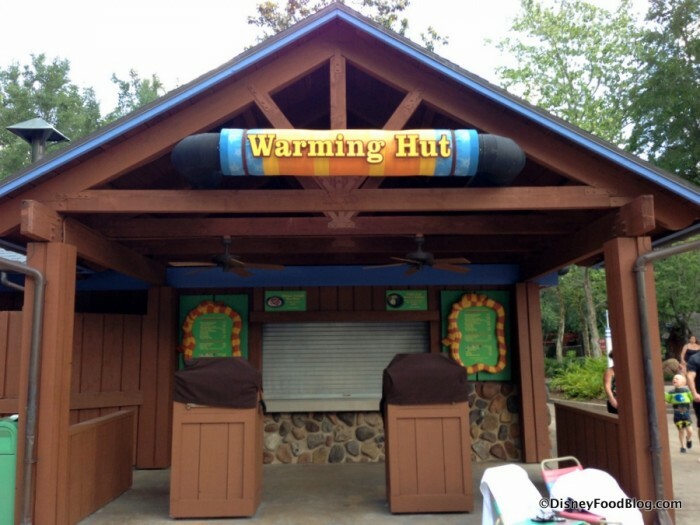 One spot that wasn’t an option on our visit was the seasonally open Warming Hut. But it might well be worth checking out if you get the chance. It offers a surprising mix of Asian and Mexican fare. We’re back where we started at Lottawatta Lodge! 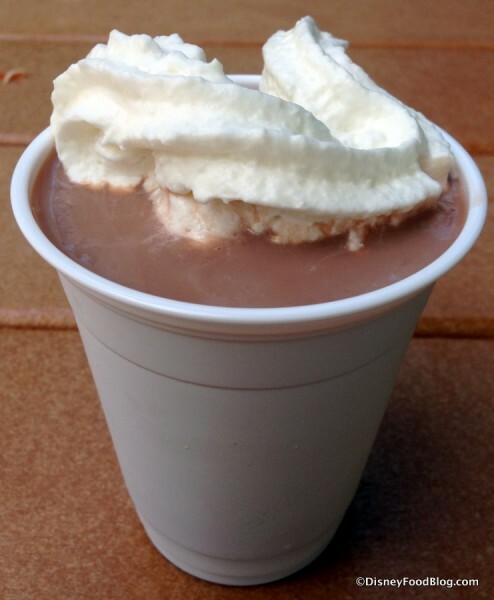 When I noticed Frozen Hot Chocolate on the menu, I couldn’t resist making a stop before wrapping up the day. 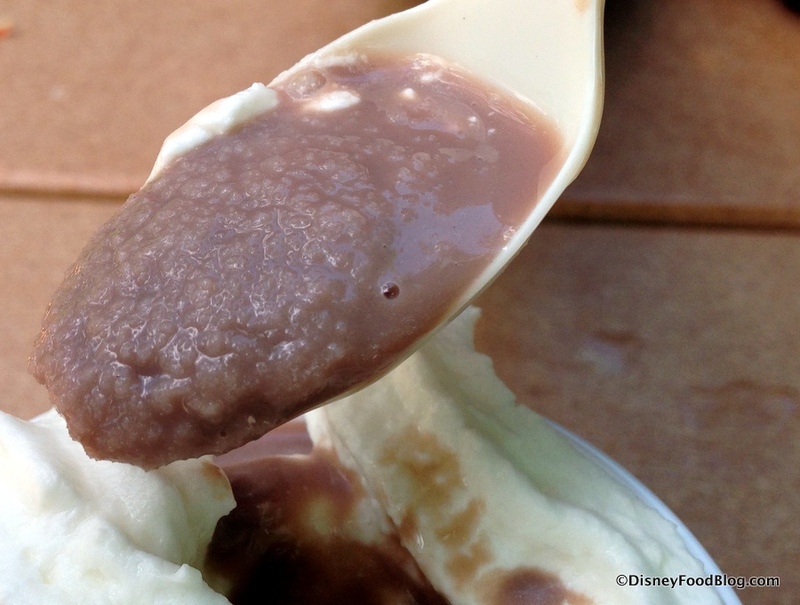 The flavor wasn’t authentic cocoa like I’ve enjoyed with other versions of Frozen Hot Chocolate I’ve tried (it tastes closer to chocolate soft serve), and the consistency is icier as opposed to a thicker Frosty-type treat. 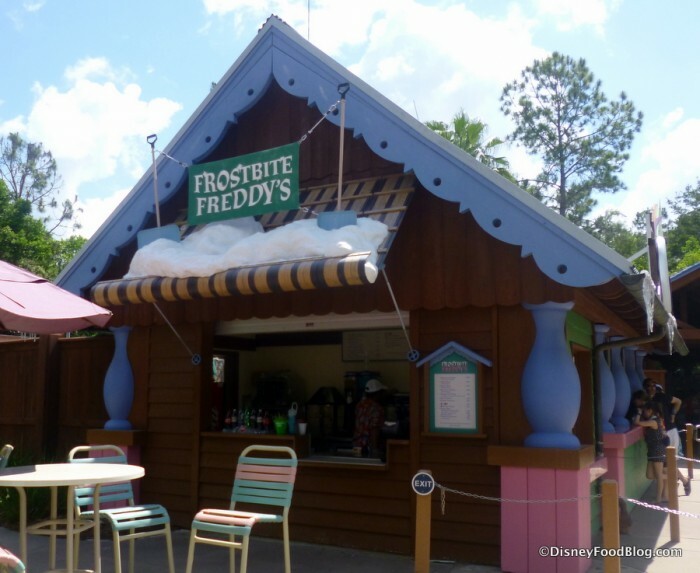 But it’s still cool and tasty, and fits in perfectly with the theme of the park — exactly what you should be sipping at Blizzard Beach’s take on what you would enjoy an actual ski lodge. 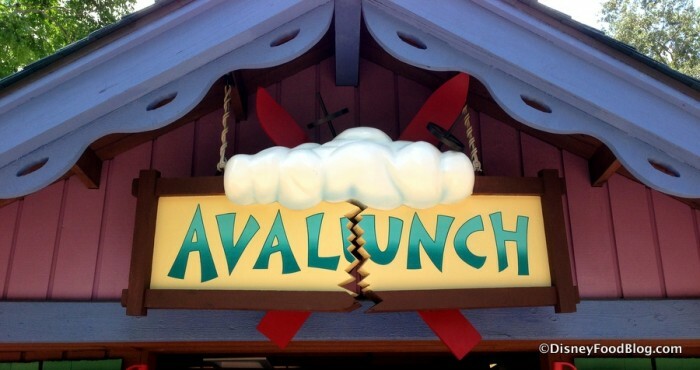 Remember that Avalunch, the Cooling Hut, the Warming Hut, and Lottawatta Lodge accept Disney Dining Plan credits for Quick Service meals, and every spot aside from the Polar Pub includes at least a few items that count as snack credits. 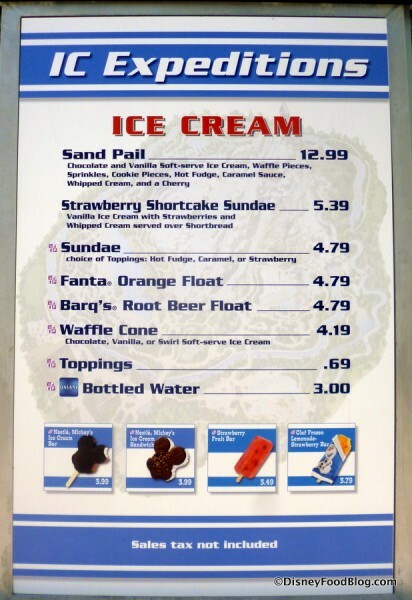 Blizzard Beach offers a fairly wide variety of choices, so pretty much everyone has a great chance of finding something to fuel up during an active day of swimming, sliding, and splashing. … but we hope YOU have a great time making a splash at Blizzard Beach! 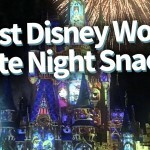 Will you be visiting a Disney World water park this summer? Please let us know with a comment! News! You’ll Never Guess Where You Can Now Get Beer Cheese Fondue, Turkey Legs Coated in BBQ Chips (?!? 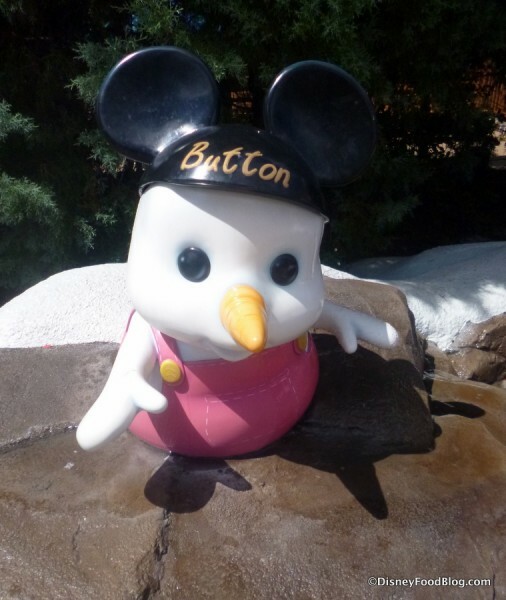 ), and MORE in Disney World! As a native Philadelphian, I can say that that “cheesesteak” is laughable compared to the Philly original. Even at a mall food court here, one would receive a hoagie roll filled to the brim with meat, cheese, and whatever extras one wanted in the sandwich. The ratio of peppers to meat is WAY off. There should be about five times as much meat as there is pictured for the amount of peppers shown. 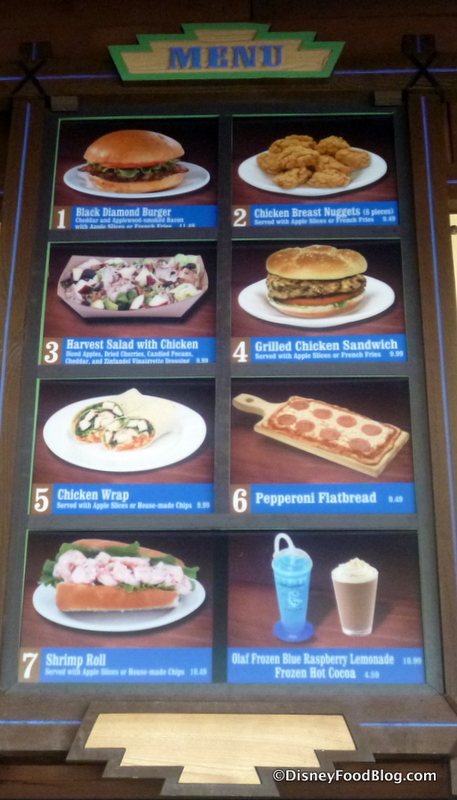 And where are the fried onions? 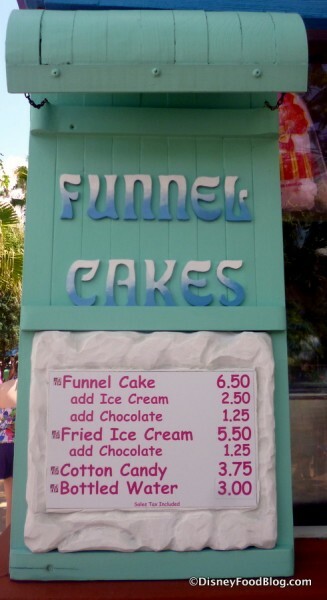 The Fried Ice Cream at the Funnel Cake place caught my eye. Thanks for this post! We have the water park and more option on our tickets, but haven’t been to the water parks in years, so it’s nice to see an overview of all the options available. 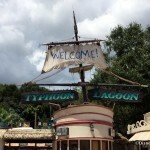 Perhaps you’ll be doing the same for Typhoon Lagoon? 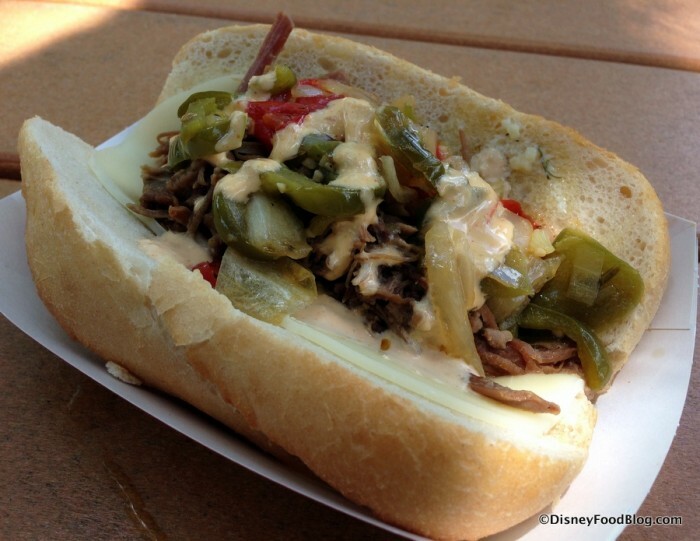 @CraiginPA – completely agree about the cheesesteak. 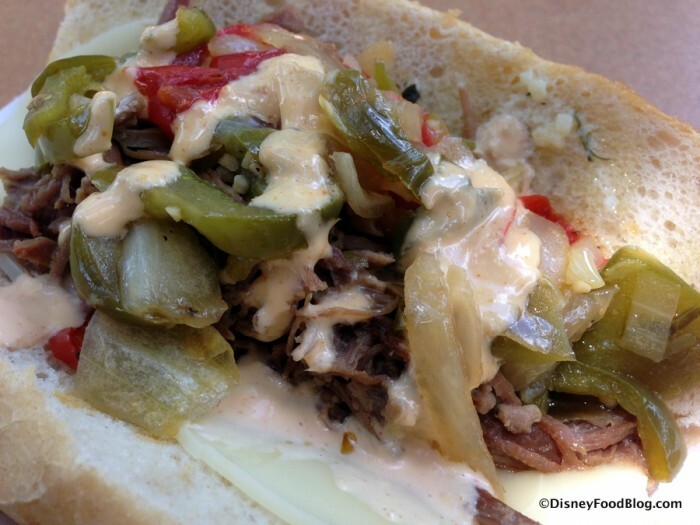 I’m also from the Philly area, and the one time I got a cheesesteak in Disney I was very disappointed with it. I should’ve known better. During a break from riding water slides in my _bathing suit_, I doubt I would want something greasy and heavy like most of the food here. I must be missing something. 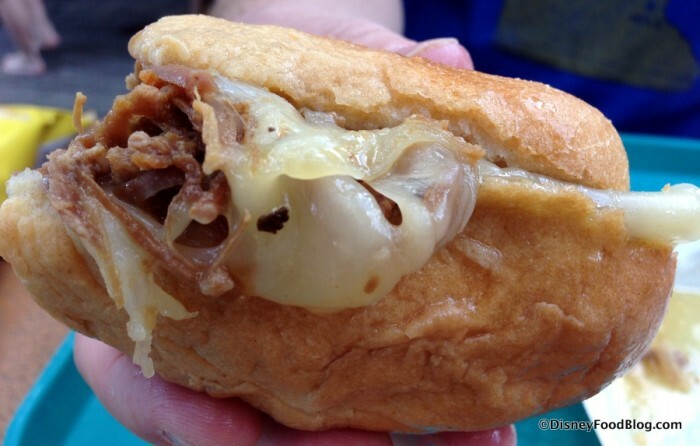 You don’t have to be “from Philly” to know a water park cheesesteak won’t match up to a “real one”. 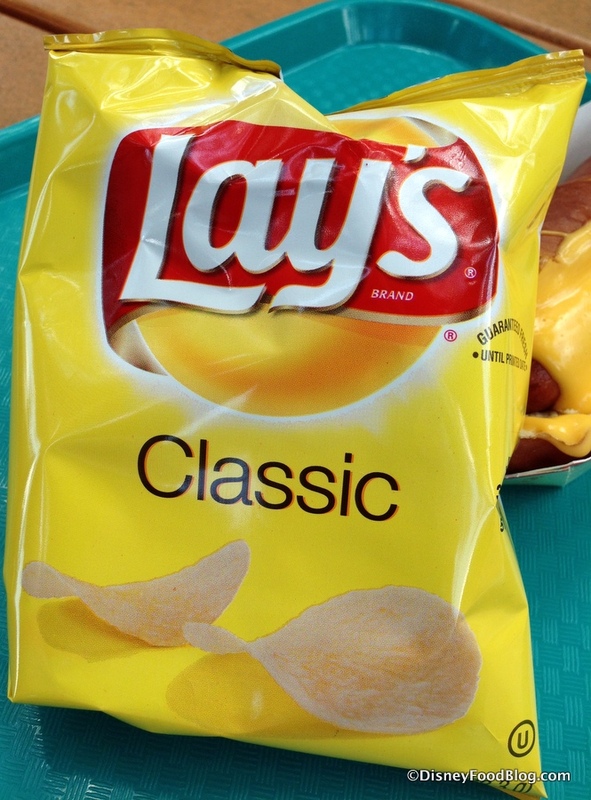 Has Lay’s always been served with all these quick service meals? I don’t recall. 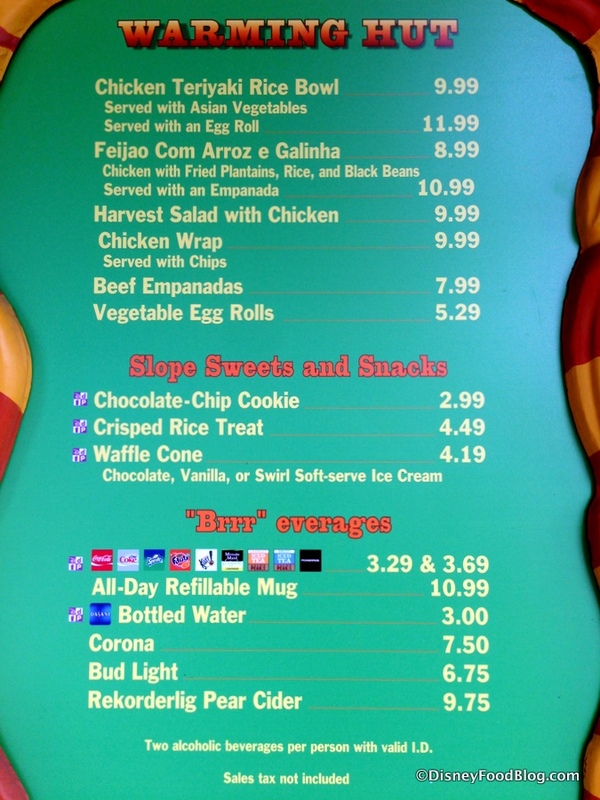 Too bad they can’t serve something a little nicer for the price, like at least some Kettle Chips or something. I’m glad you mentioned that the Philly Cheese Steak was packed as I was thinking it looked a little skimpy ~ and definitely nothing like what was pictured on the menu. The pretzel cheese dog looked better, but it seems like it would be nice if the hot dog filled a bit more of the bun. I didn’t notice a frozen Coke on any of the menus. 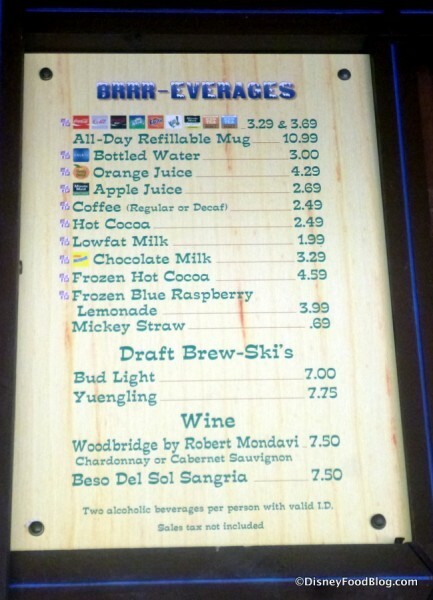 I would think that would be a great choice for a drink at one of the water parks! 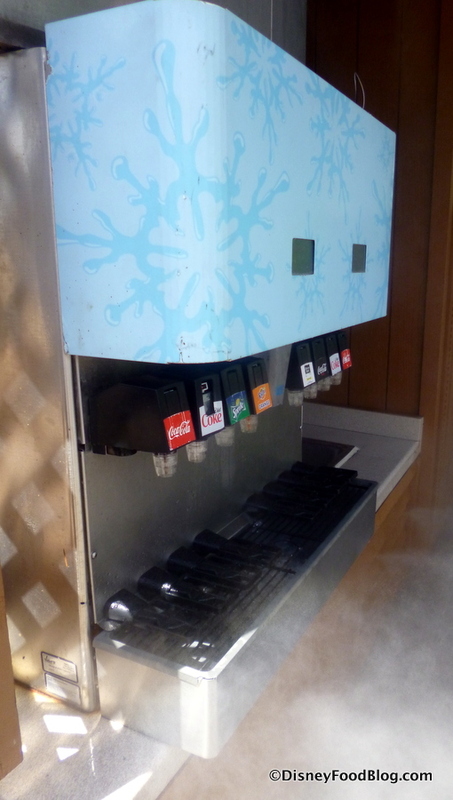 Really excited to be going to Blizzard Beach for the first time in August! Does anyone here have any recommendations for savory vegetarian food that might be hiding? 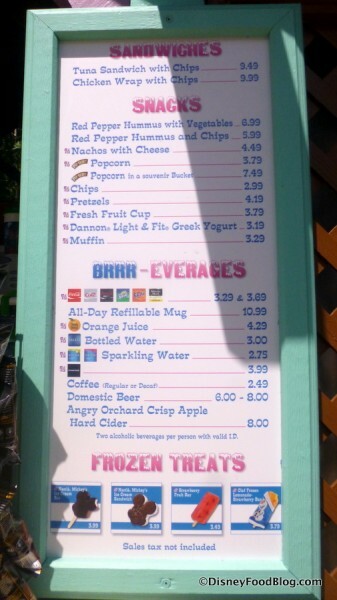 I’m hoping I’ll be able to get something beyond just hummus. for $11.29 at Lotta Watta Lodge. This looks to be the only other thing beside hummus or vegetable egg rolls.